As many of your editor’s friends know, he is often lured to trolling the tabloids, looking for juicy bits about the royal family or Hollywood royalty. Recently, while perusing the Daily Mail* for news of the upcoming Harry/Meaghan nuptials, he came across the big-headline news that three European power players – Rolls-Royce, Airbus, and Siemens, are collaborating on creating a testbed for a hybrid power system. 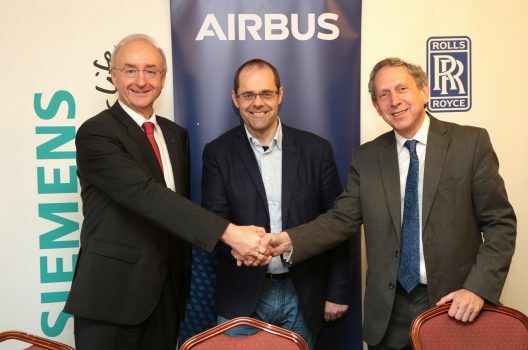 The trio will take a Bae 146 four-engine regional jet, convert it to a hybrid demonstrator by 2020, and have a production plane in place by 2030. 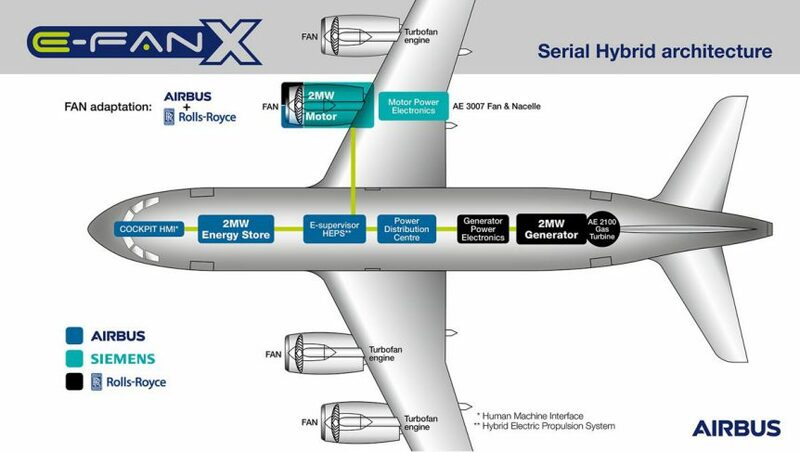 The high-wing airplane has four turbofans in place now, but the partners will replace one with a Siemens two-megawatt electric motor powered by a Rolls-Royce two-megawatt generator in the plane’s cargo hold. Other sources more normally associated with aviation news take a slightly more cautious view of the development. 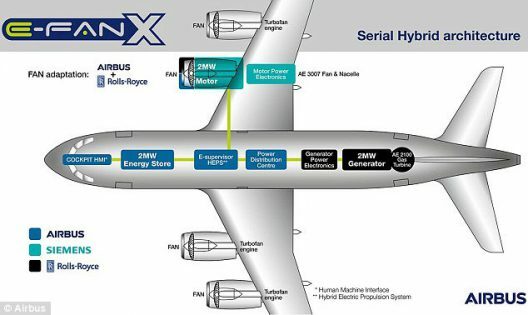 MRO-Network.com, devoted to the maintenance, replacement, overhaul side of airline operation, backsteps: “Nonetheless, it is extremely unlikely that any standard commercial flight will use electric engines within the next few decades – at least until a quantum leap in battery technology delivers vastly superior power-to-weight ratios from the best current technology. MRO explains the challenges ahead for the European trio. “E-Fan X will investigate certain challenges of electric propulsion, including thermal effects, electric thrust management, altitude and dynamic effects on electric systems and electromagnetic compatibility issues. 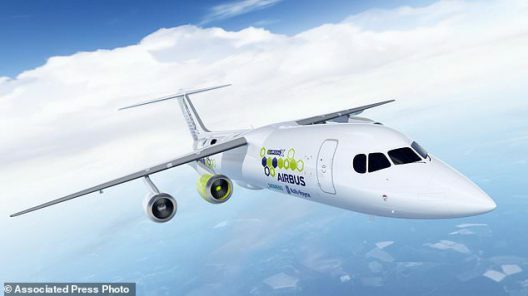 “Paul Eremenko, Airbus’ sometimes controversial head of technology, says the demonstrator ‘will pave the way to a hybrid single-aisle commercial aircraft that is safe, efficient, and cost-effective’”. ATWonline.com (Air Transport World) explains, “The new powerplant follows a series of smaller demonstrators in recent years and the partners hope to fly it on a BAe 146 testbed, replacing one of the aircraft’s Avco Lycoming ALF 502 turbofans. A second engine may be replaced with another of the new electric motors once tests have provided sufficient confidence to do so.” Although the not-to-scale drawing of the component layout doesn’t allow assessing how much space the two-megawatt system will require, one can foresee “real estate” issues in aircraft with four, or in one prediction, even eight hybrid electric units powering things. “Head of Siemens eAircraft, Frank Anton, added: ‘This large flying demonstrator will be a major step for eAircraft toward a hybrid-electric future. AS ATW notes, “The three organizations are seeking to increase the pace of hybrid-electric development by maturing the technologies, safety and reliability involved.” Aviation will be cleaner and quieter in the future, thanks to efforts such as this, Zunum’s and Jeff Engler’s Wright Electric. *That such publications are reporting on this is evidence that electric aviation is making its presence known.